Given the celebratory hubbub over the release of Google Maps for iPhone, you’d be excused for thinking that Google had instead perfected some entirely new form of transportation—portal technology, perhaps. 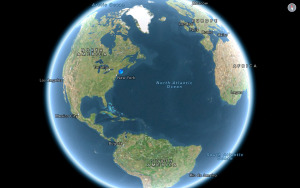 The truth is somewhat less spectacular, though it will still delight many users of iOS 6: Google Maps for iPhone is a very good mapping application that returns some much-missed features to the platform, but it’s not without its shortcomings. 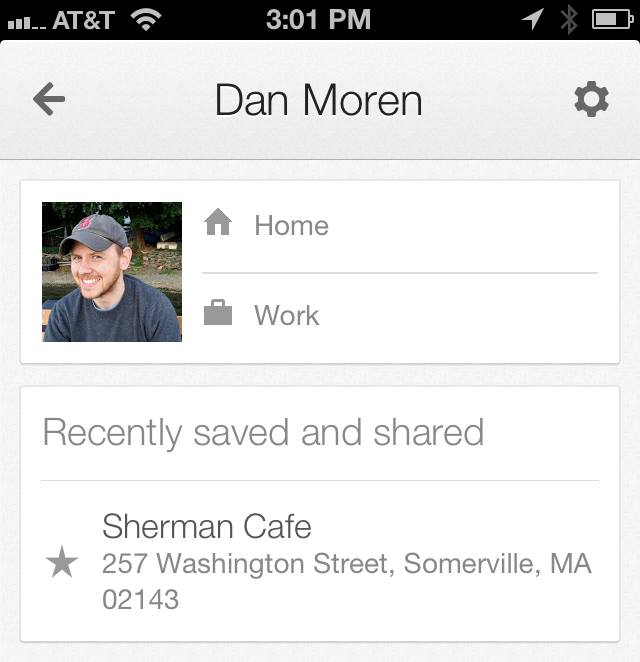 Google Maps's design is definitely evocative of iOS 6's Maps, though with Google's own aesthetic themes. 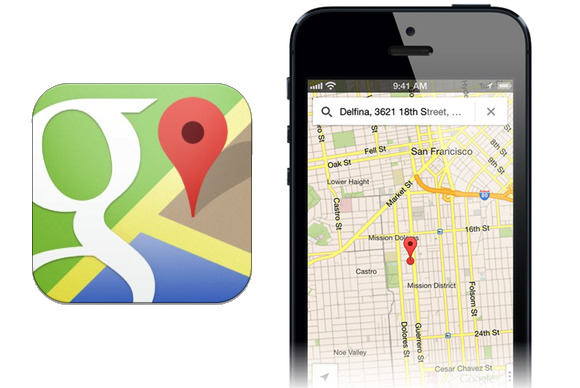 If you at least like the look of Apple’s iOS 6 Maps app, then firing up Google Maps won’t be so terribly jarring: The two look strikingly similar, down to the blue dot that marks your current location and the placement of the compass icon that appears in the top right corner when you use two fingers to rotate the map. Their aesthetics are different, though: Google eschews the use of gray/silver chrome titlebars and buttons for a spartan black-and-white interface that evokes the simplicity of its websites and services. In satellite view, Google Maps overlays roads with translucent white lines, and labels more roads than Apple does at similar zoom levels. Ultimately, though, the different approaches are more a matter of personal preference than anything else. Google Maps provides additional interface layers that can be accessed by tapping or swiping the little pull-handle near the bottom right corner of the screen, or by performing a two-finger swipe from the right edge of the screen (much like the trackpad gesture you use to expose Notification Center in Mountain Lion); I found that last gesture a little touchy—it often ended up triggering accidentally when I was trying to simply pinch-to-zoom the map. 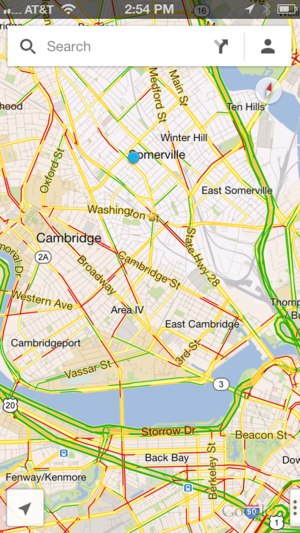 You can apply multiple layers simultaneously in Google Maps, though the result can often be confusing. Those layers—Traffic, Public transit, and Satellite—can be applied individually or in any combination, unlike iOS 6’s Maps, which give the option of either traditional maps, satellite imagery, or a hybrid view. There’s also an option for Google Earth, which you can tap to launch the app if it’s installed (otherwise, it’ll take you to the App Store). That’s probably an attempt to fill a gap in Google Maps’s functionality, since Google Earth provides a 3D satellite view akin to Maps's Flyovers. However, you can pan up and down in Google Maps by using a two-finger swipe; in the traditional map mode you will see translucent 3D models of many of the buildings. 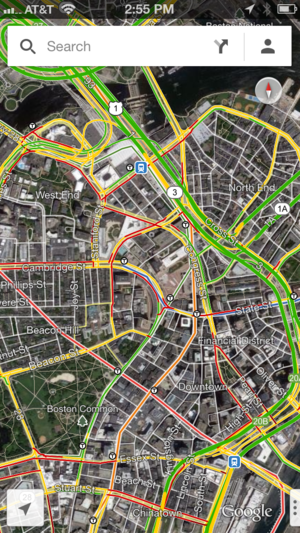 While the satellite imagery in Google Maps is about on par with iOS 6’s Maps, Google offers more traffic coverage, though it doesn’t seem to provide construction and accident advisories as iOS 6’s Maps do. And as for public transit, well, that’s a whole different kettle of fish (see below for more). In terms of performance, zooming in and out of Google Maps is at times a bit more sluggish than I’d like, especially compared to iOS 6’s Maps; it can take longer for Google’s map tiles to resolve and become readable. The use of vector-based tiles in Google Maps makes loading new data smoother than the old iOS 5-and-before version, and it allows the app to store more information when you’re offline; in my tests, Apple Maps stored a larger geographic area, but trying to zoom in to an area that wasn’t loaded, you eventually get blank tiles—Google Maps, by contrast, just lets you zoom further into a blurry tile. One major absence that I imagine will be addressed sooner rather than later is that Google Maps is designed only for the iPhone and iPod touch; there’s no native iPad interface, though you can run it in the tablet’s iPhone compatibility mode. Search is Google’s bread and butter, and the company’s been refining its maps data for years now. As a result, it’s pretty good—and it definitely has an edge over Apple’s Maps in my testing experience. 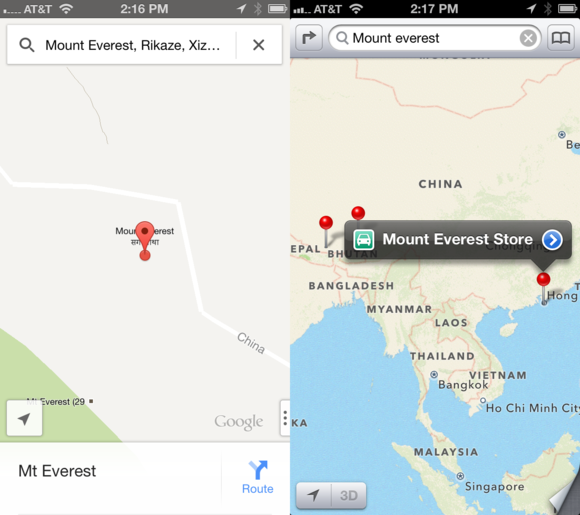 Of the two, Google Maps (left) is far less confused than iOS 6's Maps (right) about the location of the world's tallest mountain. If you search for a term that matches multiple results, Google Maps will mark them on a map; you can view the full list of results by tapping on the list icon that appears in the search bar, or by swiping through the details bar that appears at the bottom of the screen. While I didn’t have time to do a comprehensive investigation of Google Maps’s international locations, a broad survey of cities from around the world showed generally good coverage in places like Paris, Riyadh, and Tokyo. Apple’s coverage in the same locations was close to on par in some locations, and decidedly less comprehensive in others (Riyadh in particular). 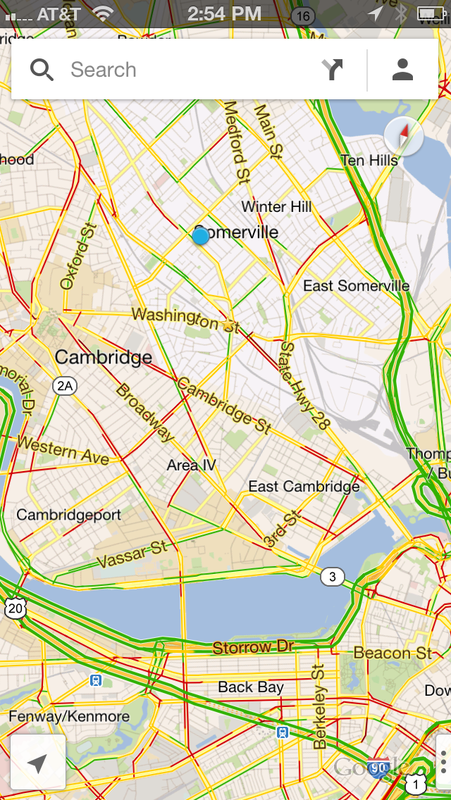 Again, this isn’t surprising, given Google’s long and abiding interest in mapping. Searching for multiple locations in Google Maps plots them in an overview, but also lets you swipe through the options using the bar at the bottom of the screen. Getting information about a specific place of interest is as easy as tapping on it; instead of the popover you may be used to, you’ll instead get a bar at the bottom of the screen with the place's name, a Zagat rating (if applicable), how many reviews it has, and how long it will take to get there by your current chosen mode of transportation. Tapping or swiping upward on the bar will display more information, including pictures, contact information, and reviews. One neat feature: Google provides an “at a glance” section that pulls out commonly mentioned terms from customer reviews. You can also share a location via mail or Messages, or copy it to the clipboard; in each of these cases, the location will be turned into a short URL. Street View makes a triumphant return to the iPhone in this detail view, and now includes a nifty gyroscopic mode that you can enable, letting you pan your phone around to view a scene instead of tapping and swiping. There’s also a similar feature called "See inside," which gives you a Street View-style look into certain places of business (it seems most prevalent for local businesses and eateries than for chains). Both are nifty features, but I find their overall utility questionable beyond the novelty of showing them off. Overall, Google Maps also does a good job of correcting my search mistakes. For example, when I misspelled the name of a local Italian restaurant, Google prompted me with the correct spelling; Apple’s Maps, by comparison, just told me that it couldn’t find any results. Google also seems to be more adroit at autocomplete, quickly winnowing out what I’m looking for and providing results that better match my expectations. That said, Google Maps does have at least one notable shortcoming in search: Unlike Apple’s built-in Maps, it can’t recognize your contacts. So if you start entering John Smith, Google Maps won’t offer to find John Smith’s address—rather, it will look for a John Smith Street. 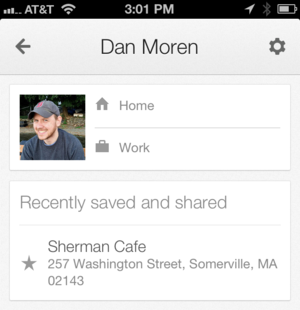 Log in with your Google profile and you can set addresses for your home and work, as well as save bookmarks to locations. Some of this can be addressed—pun firmly unintended—by logging into your Google profile, which Google Maps will prompt you to do when you first launch the map. If you don’t, it will subsequently suggest you do so every single time you make a search. That profile lets you set work and home addresses for yourself—entering them adds a briefcase icon and a house icon to those map locations, respectively, and they pop up as quick-pick options when you start a search. Google Maps's turn-by-turn directions provide automatic audio prompts and let you skim through directions. While iOS 6 brought free turn-by-turn directions to the mobile operating system, Google has now fired back with its own wayfinding solution. Google Maps for iPhone includes not only turn-by-turn directions for driving, but also routes for walking and, more significantly, public transit. If you’ve already searched for a location, getting directions to it is just a matter of tapping the blue car/person/transit icon in the bottom right corner, but woe betide you if you want to find out how to get, say, from that location to somewhere else, or starting from any place that's not your current location. There are Directions to here/Directions from here buttons, as in Apple’s Maps; instead you’ll have to clear out any terms from the search bar, tap the Route button, and re-enter the starting point and destination. 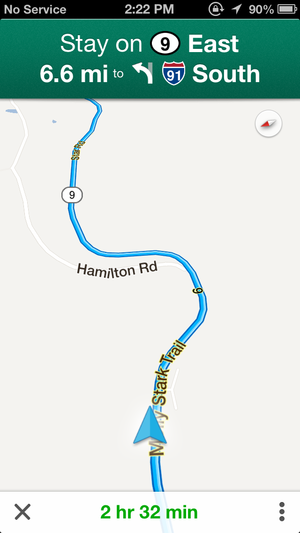 Google’s turn-by-turn directions are, as expected, very good. Plotting a destination gives you multiple options for routes, letting you quickly swipe or tap between them to choose the one you want; each option provides the time it will take, distance, and the primary routes. Avoiding highways and tolls are options as well. 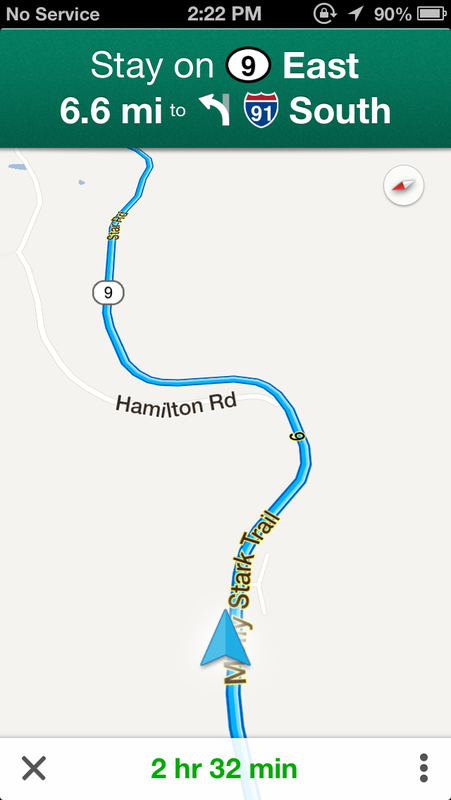 As with iOS 6 Maps, Google Maps provides audio cues for making turns. While the app lacks the low-level connections with iOS that allow it to display directions on the lock screen, it can still provide notification banners and audio cues while the phone is locked. You can actually swipe through Google Maps’s turn-by-turn directions, which lets you preview the next turns you’ll make. Doing so will pause your directions, but you can tap the Resume button in the bottom left to jump back to where you were. Tapping the options button in the bottom right lets you view a step-by-step list or mute voice guidance. Walking directions are serviceable; as on iOS 6, they provide a list of directions that you can manually swipe through as you go. In general, the actual directions seem on par with iOS 6’s Maps, though I noted that in many places, there was no overlap among all of the multiple routes the two apps offered. I also found I often disagreed with those routes: In some cases, none were the ones that I, as a local, would take, though all would get you to your destination in the end. 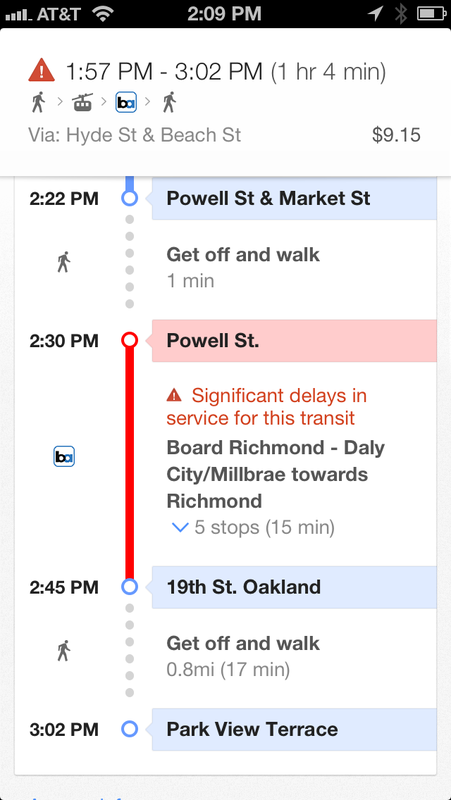 Public transit directions are color-coded with appropriate icons, and even warn you of travel advisories. If there’s a major edge to be had with Google Maps, it’s the app’s support for public transportation directions. 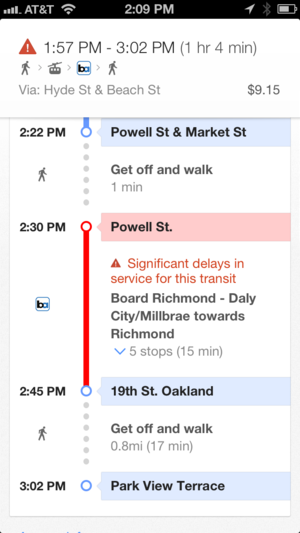 As part of the end of Google’s involvement with iOS’s Maps, transit directions fell by the wayside, but they’re now back with a vengeance. Google has an extensive transportation database covering most major cities and even many smaller ones, including information about buses, subway, train, and tram / light rail. When plotting directions using public transit, you can specify a departure or arrival time as well as choose which forms of transportation you’d like the directions to take into account. As with walking and driving directions, public transit gives you multiple route options, each with a overview of the route, the amount of time it will take, the fare (if available); it'll also provide you with a notification if there any applicable transit advisories. I appreciate the step-by-step transit instructions, and especially the fact that Google appropriately color codes lines or marks them with an icon where available; it makes the directions a lot easier to follow, for those who are unfamiliar with a particular city, or, for local residents, take in at a glance. The directions also provide a collapsible list of stops on certain lines, which is useful if you’re trying to track your progress—though Google Maps does provide an overview map of your journey, it doesn’t let you step through as it does with walking and driving directions. However, I did notice some shortcomings where Google Maps again wouldn’t suggest particular routes that I’d take—for some reason, in many cases it would seemingly ignore the bus that runs down my street in favor of more oblique routes. Still, the overall benefit of having public transit built-in to the app is hard to deny; it makes Apple’s third-party integration approach seem clumsy and incomplete by comparison. Google's raised the bar here and I’d be surprised if iOS’s Maps didn’t evenetually incorporate public transit information. Google Maps is a very solid entry in mapping and navigation apps; those that have been waiting for it since upgrading (or holding off their upgrades) have probably already downloaded it. But given that it’s a free app, having it on your phone costs nothing but its slim 7MB download. Best of all, installing it isn’t an either/or proposition: Google Maps and iOS’s Maps can happily live side-by-side on your iPhone, and you can choose whichever you like at any given moment. As it is, there’s no reason not to download Google Maps and give it a try, and many will find it preferable to Apple’s built-in offerings. And, of course, the race is now on in earnest for both Apple and Google to bring new features and improvements to their respective software in an attempt to earn the loyalty of you, the user.